This tunnel was daylighted (removed) September 2003. Unity Railroad (Unity Railways Co) served the coal mines at Renton in Plum Borough. The line branched off of the Bessemer & Lake Erie Railroad at Unity Junction north of the BLE North Bessemer yard. The Unity RR follows a high line along the north side of the Little Plum Creek valley toward New Texas and Renton. The railroad was taken over by the BLE in the 1960s. The Consolidated Coal mines and the railroad were later abandoned. The Unity RR roughly paralleled a Pennsylvania RR branch line also built after 1903 along the south side of Little Plum Creek. The two rail lines meet near New Texas before continuing to the Renton mines. This part of the PRR line (south and east of Unity Junction) was an extension of the Plum Creek Branch which followed Plum Creek from Verona (connecting to the Allegheny Valley RR) along the border of Plum and Penn Hills (Penn Twp) to the mining towns of Unity, Center and Trestle. The Plum Creek Railroad is shown as a separate company on the 1876 and 1903 maps. Other bridges on the Unity RR line are noted as being built in 1918 and 1925. 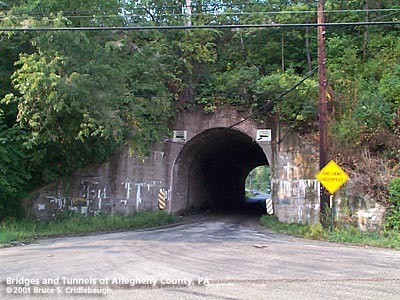 The Elicker Tunnel allows Elicker Road to pass through an embankment carrying the Unity RR above.